“NHL hockey in Las Vegas.” Many still say that as a question rather than a statement. Hey, we get it. It doesn’t take a meteorologist to know that Vegas is hot and ice is cold. “The two don’t mix,” they say. We hear it all the time down here: “Hockey only works in Canada,” “There’s no way that a desert city in America is going to support a hockey team,” blah, blah, blah. 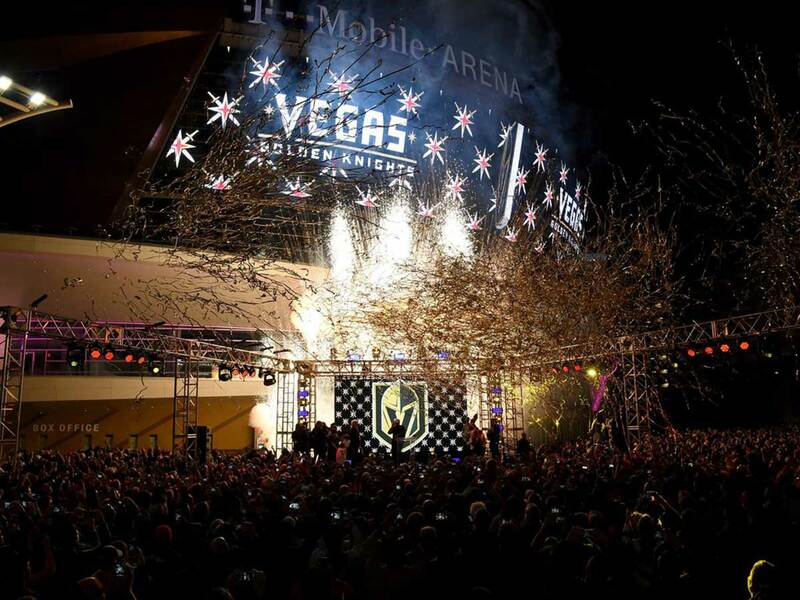 While pundits and armchair goalies are loudly predicting the demise of Las Vegas hockey; Vegas locals, the Vegas Golden Knights and fans of the opposition (and even our friendly Canadian neighbors) are letting their salads fly (that’s hockey lingo for hair, BTW) and proving otherwise. The puck has yet to (officially) hit ice in Vegas and the hockey bug is already buzzing. Need proof? Just check out the attendance numbers for the Golden Knights’ first home preseason game. Check it: 17,101 people packed T-Mobile Arena that night. Where you haters at now, brochacho? Still not satisfied, Mr. McNeedy Pants? Swing by the Golden Knights’ practice facility, City National Arena. Just pop up to the second level of the facility and you’ll find MacKenzie River Pizza, Grill & Pub. The unofficial team bar, this place is decked out in all Golden Knights everything. And, adding the proverbial maple syrup to the top of the sundae, MacKenzie’s looks right down onto the Golden Knights’ practice rinks. **Canadian Accent** Pretty sweet, eh? Even being elbow deep in some poutine (not sure, but this might be the official food of hockey), we couldn’t help but notice how alive this place was. Literally, hundreds of men, women, children and man-children have packed this place for each preseason game to slug brew and talk puck. We’re as happy as a Mountie kissin’ a moose. Tickets for the home opener on October 10th against the Arizona Coyotes are going to set you back anywhere from $100 – $2,000 bones. If your love for body-crushing hits and fancy footwork knows no cost, COP. THAT. TICKET. On the other hand, if you’d rather not shell out for the price of minimally invasive surgery, we got you covered. There are plenty of things to do in Las Vegas and because everyone in town wants to get in on this piece of history, let’s just say there isn’t going to be a shortage of places to catch the game. You can’t talk hockey in Las Vegas and not mention the Golden Knights’ home ice, T-mobile Arena. If you want to get nestled right up against the pearly gates without footing the bill to get inside, look no further than Beerhaus. 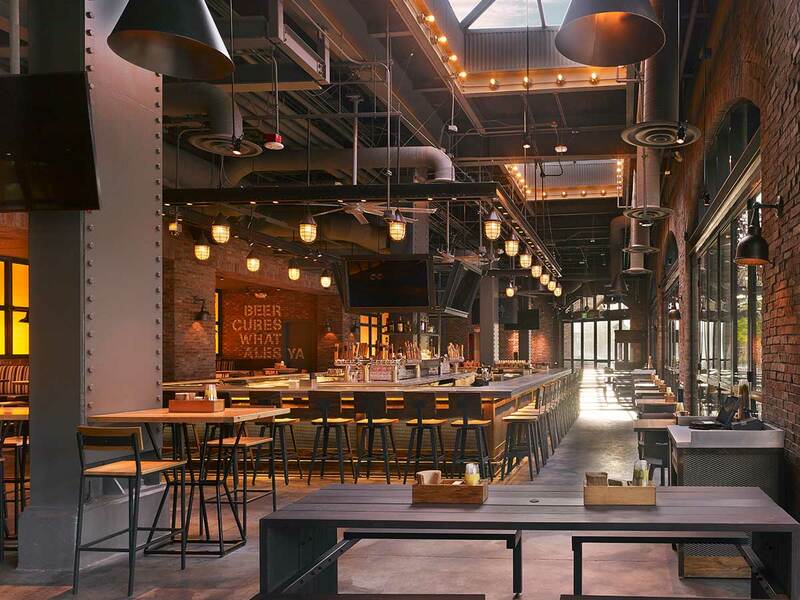 Located just steps away from T-Mobile Arena at The Park, Beerhaus is primed for hockey. We’re talkin’ more than 20 beers on tap, a ton of brats, super soft pretzels and enough cheese to make the state of Wisconsin blush. Prefer to keep the madness at arm’s length? Then pull up some stump at Beer Park. 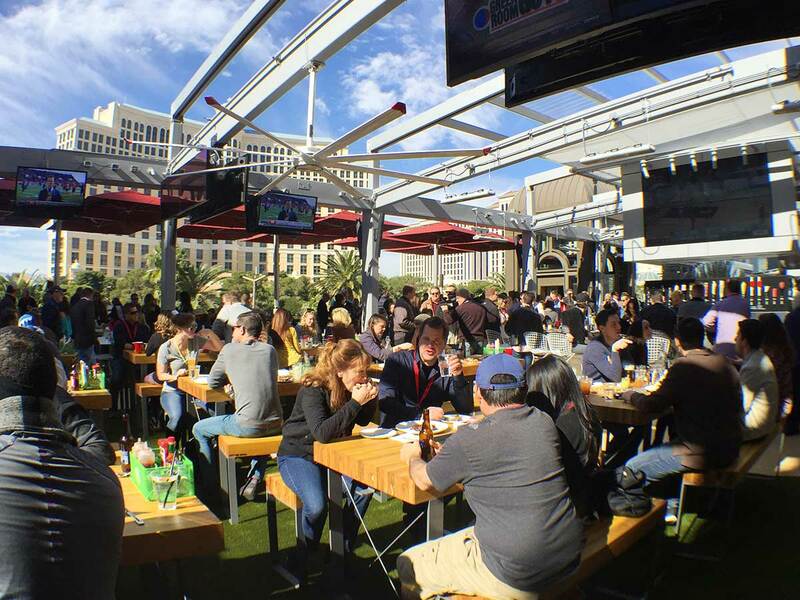 Nestled outside of Chateau Nightclub on the second floor of Paris Las Vegas, Beer Park has 36 different types of suds on tap and a menu full of meat, taters and salads. Obvi, they have a Zamboni load of TVs to catch the game, but what makes this place the Wayne Gretzky of places to watch hockey in Las Vegas is the view. Other than a new flannel, there’s nothing more comforting than hockey on the tube while the Bellagio Fountains do their thing in the background. After a game full of power plays and penalties, you’re going to want to capitalize on that adrenaline spike. Thankfully, high octane attractions in Las Vegas are as common as ice in hockey. And trust us when we say that there is no greater adrenaline rush than the Vegas Nights tour. 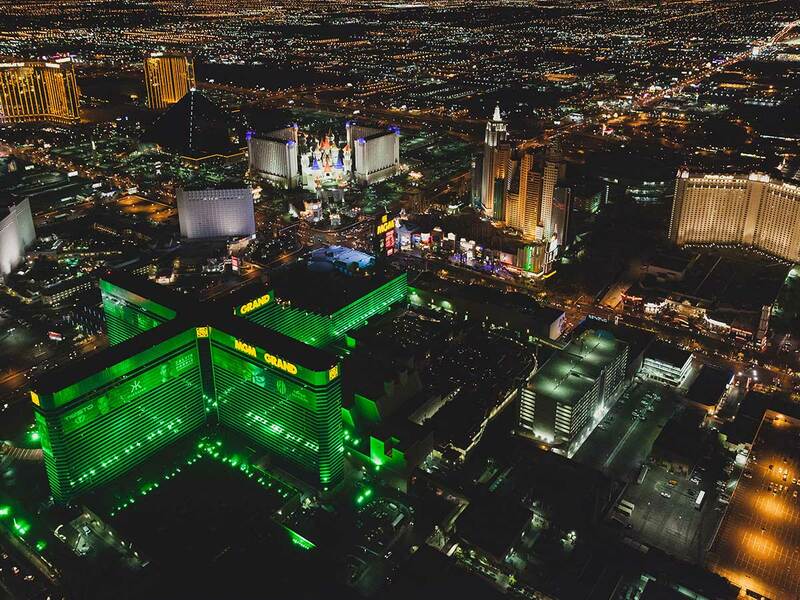 It’s no secret that the Las Vegas Strip is a sight for sore eyes, but when you take it in from the comforts of an Eco-Star helicopter? Game changer. Prefer the comforts of four wheels and the open road? 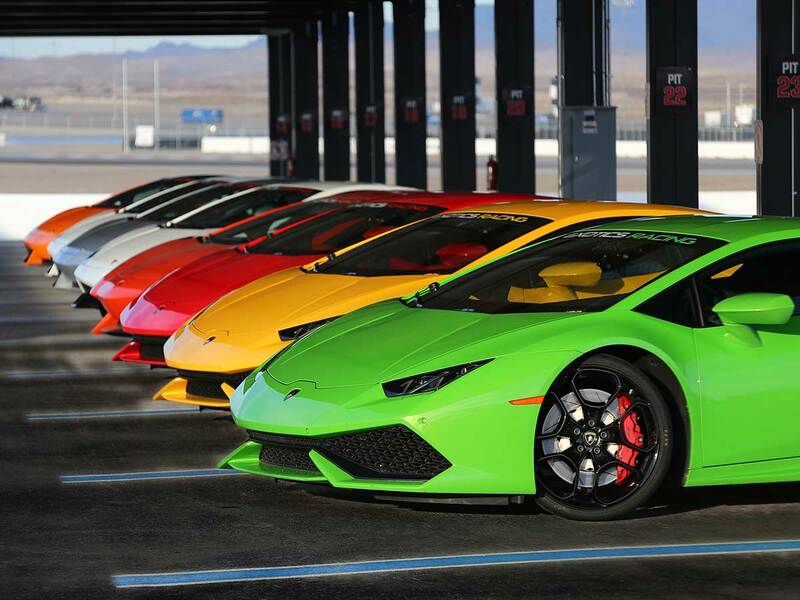 Then park your caboose behind the wheel of a foreign import or flex some American muscle at Exotics Racing. Imagine letting your salad (remember, that’s slang for hair) or muzzy (mustache) flow in the wind while pushing a Lamborghini Gallardo or a Ferrari 458 Italia. Want a more “ice-like” experience? Ride passenger in a Corvette Z06 as a professional drifter whips you around the track at full speed. Insider tip: unless you want to upchuck your poutine in the passenger seat, maybe try to wait until after the fact to stuff your face. 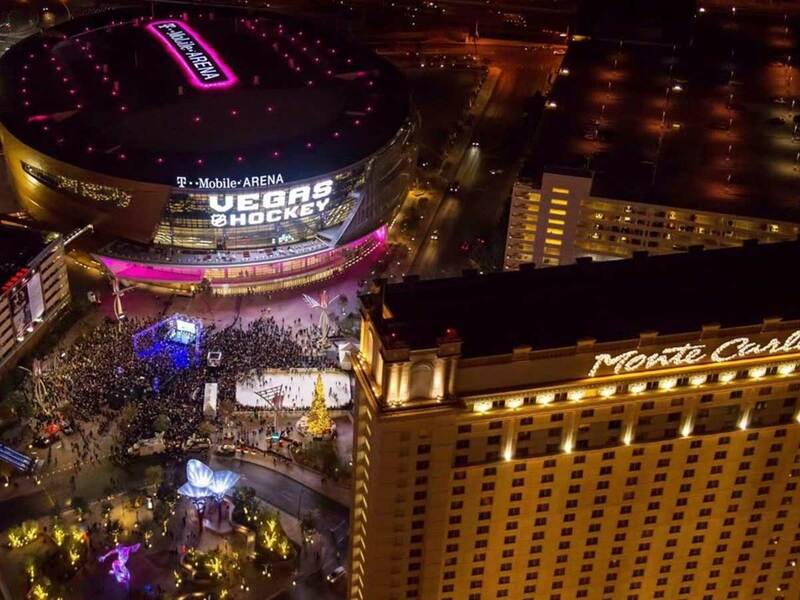 Hockey in Las Vegas is here to stay, folks. Want to say otherwise? Now that Vegas is a hockey town, we have these things called “goons.” We’re pretty sure they’d be more than happy to share their talents with you. ***Because we are #VegasStrong, Golden Knights and owner, Bill Foley will honor and pay tribute to first responders and all of those affected by the Route 91 Harvest tragedy.